With the best season in school history now in the books, it’s time for the Kent State football team to start focusing on the 2013 season and new coach Paul Haynes has a big challenge facing him right off the bat. 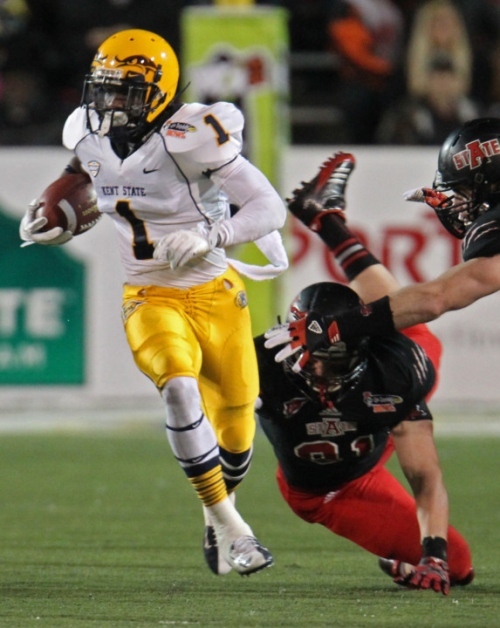 Namely, how to convince All-American running back Dri Archer that coming back for one more year at Kent is a good idea. On the one hand, Archer’s stock will probably never be higher after leading the Golden Flashes in rushing (1,482 yards, 16 touchdowns and 9.0 yards per carry), receptions (39 catches for 561 yards and four touchdowns) and averaging 36.9 yards per kickoff return with three touchdowns (before teams stopped kicking to him). On the other hand, Archer has only this big year on his resume (he missed last season over an academic issue) and he is just 5-foot-8 and 175 pounds. After watching Cleveland’s Travis Benjamin (who’s two inches taller than Archer but the same weight) look pretty small on an NFL field, it’s easy to wonder if there is a place for Archer in the NFL. And since Kent State was the only FBS school to offer him a scholarship, Haynes may be able to play the loyalty card a little bit. Archer owned MAC defenses this year and appealing to his competitive nature is a good tact for Haynes to take. But after hurting his knee in Kent’s loss to Arkansas State on Sunday night, Archer may not want to risk getting hurt and missing parts of his senior year. Before the injury, Archer ripped off a 44-yard run and scored Kent’s only touchdown on an 18-yard reverse that showed his talent. Working against Haynes could be the fact that he has no relationship with Archer – yet. Part of it is being selfish, but we hope that Archer comes back for his senior year. Another year of experience can’t hurt and if he can learn to return punts and become a reliable receiver, it’s not that hard to see smart offensive coordinator using his talents. After all, Darren Sproles (who is just 5-foot-6 and 190 pounds) has been able to carve out a pretty decent NFL career so far. If Haynes can convince Archer to come back next season, it will be the first big win of his head coaching career. And having Archer on the roster would go a long way toward helping Haynes and the Golden Flashes add to that win total in 2013. I am an ASU fan and I honestly thought he was the best player on the field until he got hurt. If he had been able to he healthy for the entire game, Kent St would have won. There will be a place for him on Sundays and if the injury isnt too serious, he should go this year. Got to make that money when you can because there are too many ways to get hurt in football. I know, it seems like he will leave but the more I think about it the more it feels like he could use another year to refine his game. Whatever decision he makes, it will be interesting to see if someone can use his skills in the NFL.